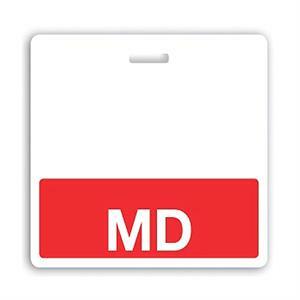 Make sure your medical doctors are clearly identifiable to patients and guests by issuing Badge Buddies! These durable role-recognition cards make it easy to identify the title of a worker at a glance, eliminating confusion and anxieties that can come with patient care. Badge Buddies are made of a durable Synthetic Paper. They're designed to hang behind an existing ID credential, attaching through a slot with a strap clip, lanyard or badge reel. These Badge Buddies feature a red color bar and printed "MD" text, making them the perfect Badge Buddies for your doctors. By clearly identifying your doctors, your patients and guests will no longer have to wonder who is providing care, creating a more comfortable environment for all.